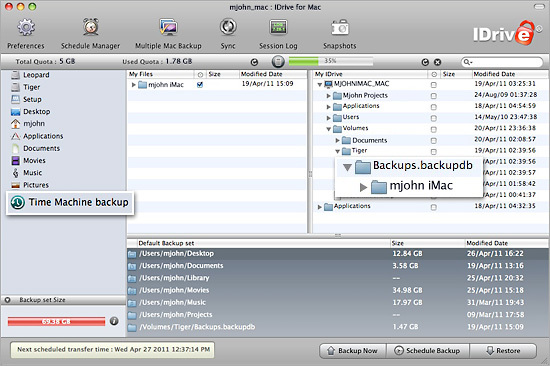 We are excited to announce that IDrive for Mac can now backup your Time Machine drive to your IDrive account! Getting started is easy, simply install the latest version of IDrive for Mac from IDrive.com and check off which computers’ data you’d like backed up to your IDrive account from the Time Machine sidebar item. Once your Time Machine has been backed up to IDrive you’ll have an off-site copy in case your local Time Machine fails or is otherwise destroyed. You can easily recover your data – individual files and folders or the entire backup – by downloading the Time Machine data or, if your Time Machine is quite large (hundreds of GBs), you can order an IDrive Portable Rapid Serve. IDrive Portable is a 320GB USB hard drive built by IDrive – the cost is $69.95 + tax with free shipping inside the US. We load your Time Machine data to your IDrive Portable and ship it to you. Plug the drive into your Mac, run Migration Assistant and you’re on the way to recovering your data. Send your questions and comments to askidrive@idrive.com or join the conversations on Facebook and Twitter.